On arrival to TOLEDO you will meet your private local guide who will take you on a morning tour of the city's important monuments: Synagogue (Closed on Mon. ), Cathedral (On Sun. after 2pm), San Juan de los Reyes, Santa Maria la Blanca, etc. After lunch you have the rest of the afternoon to walk the streets on your own. 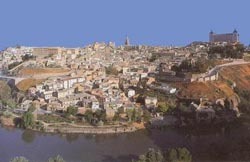 Description: This is a full day private excursion to the historic city of Toledo. The ancient city of Toledo, once capital of Spain, offers one of the most genuine collections of the richest artistic samples in Spain (Arabian, Jew, Mudejar, Gothic, Renaissance and Baroque). The historic city centre is one of the largest in Spain, and has more than 100 monuments, prompting UNESCO to declare it a World Heritage city in December 1987 in recognition of its uniqueness. Toledo has always been regarded as the city of three cultures (Christian, Jew and Islamic) and here we will spend a full-day visiting the old quarter, Cathedral, Synagogue, etc.